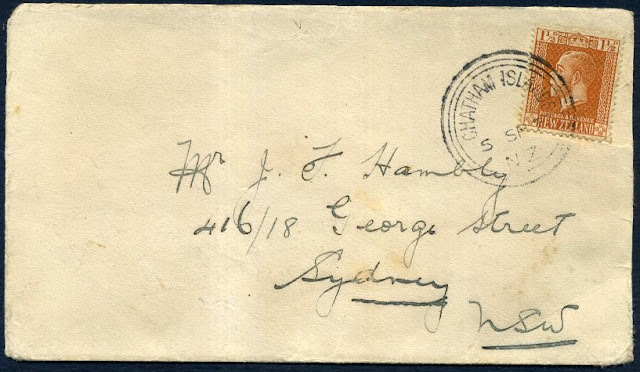 This post was originally intended to show two stamp issues that were issued with subjects concerning the Chatham Islands and the Moriori. 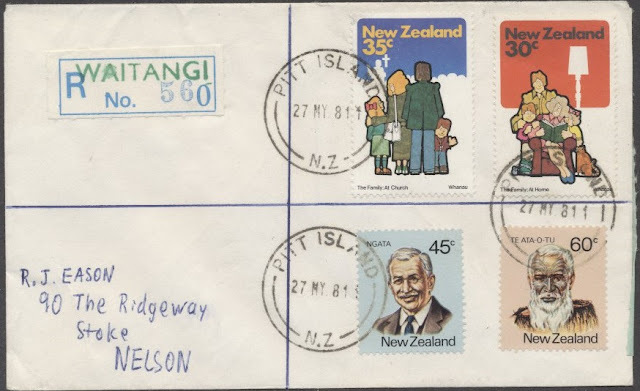 We have added extra stamps from other issues featuring these same subjects so now we changed this post to the status of a thematic collection. The first European to discover the islands in 1791 was Lieutenant William Broughton who named them after the ship in which he was sailing to Tahiti. 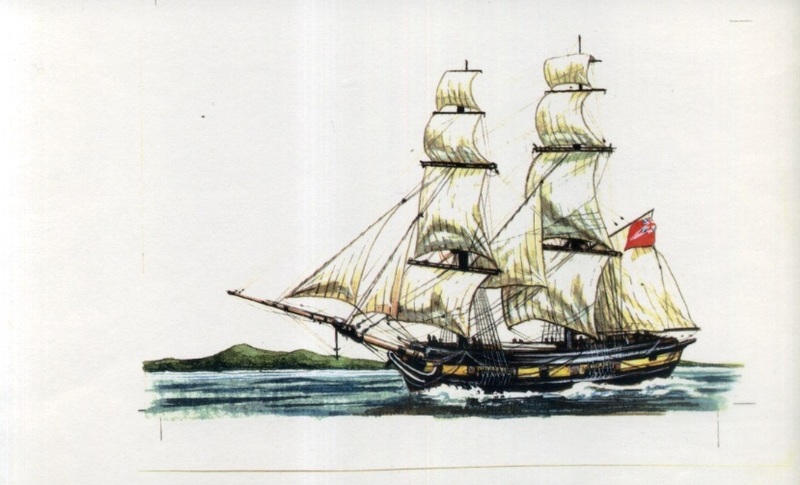 On 29 November 1791 Lieutenant William Broughton's storm driven brig 'Chatham' anchored off a large, unchartered island some 870 kilometres east of New Zealand. The long isolation of the island inhabitants, the Moriori, was over. The Chatham Islands group, which consists of Chatham and Pitt Islands and some smaller islands, lies 422 miles south-east of Wellington. Chatham is the largest of the islands (about 222,500 acres) and its chief settlement is Waitangi. The smaller Pitt Island has an area of approximately 15,300 acres. Almost a quarter of the main island is covered by shallow lagoons, the largest of them called Te Whanga. The land carries predominantly fern and pasture with some karaka and nikau palms. islands were discovered by Lieutenant William Broughton in 1791. 1c - Chatham Islands Lily. 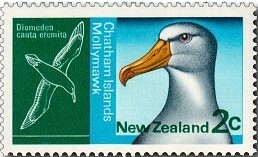 2c - Chatham Islands Mollymawk. 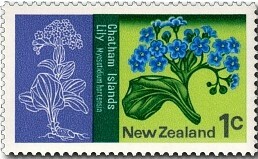 1c - Chatham Islands Lily. 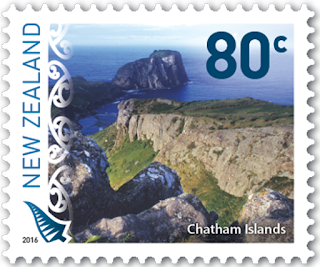 2c - Chatham Islands Mollymawk. Chatham Islands Mollymawk (Diomedea cauta eremita). This bird is one of the Albatross family, a sea bird with a large wing spread and a hooked bill. In other parts of the world, it is also known as a mollyhawk or mollymoke. The name is a corruption of the Dutch 'Mallemuck', derived from 'mal' (foolish) and 'mok' (gull). 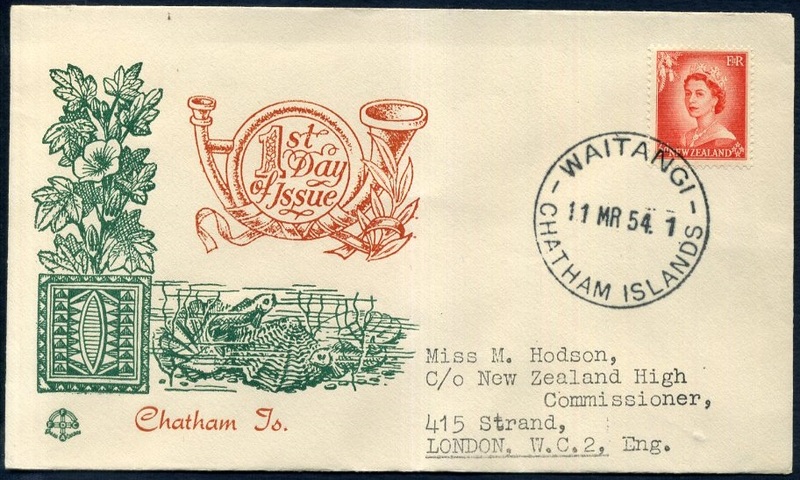 A First Day Cover showing both stamps with a very clear cancel of the main settlement on the islands, Waitangi. 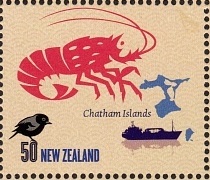 The cover features another illustration of the Chatham Island Lily and a map showing the two main islands. 1989 Heritage Set 2 - The People. 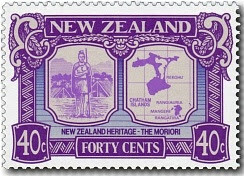 Since a large part of this post is about The Moriori people I have decided to use one other stamp that features them. 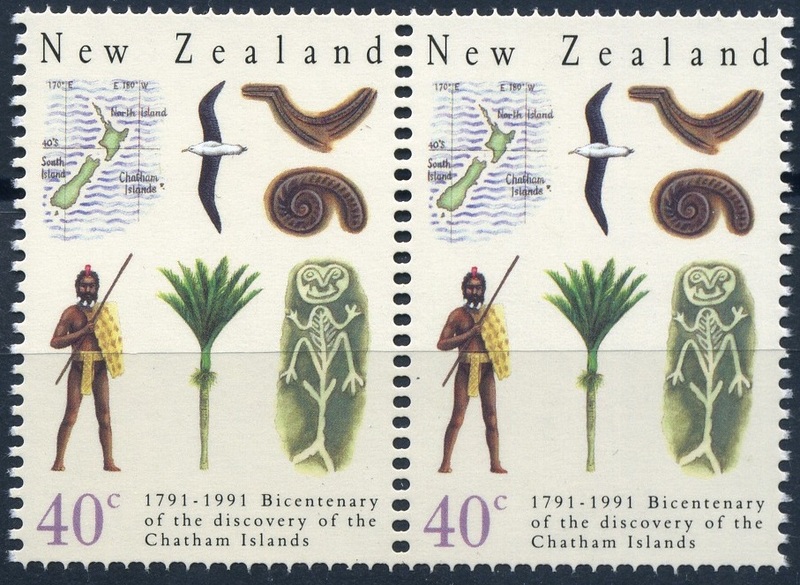 Below is the lowest value of this set showing a Moriori man in traditional dress and the map of the Chatham Islands. Little is known about the ancestry of the Chatham Island Moriori, a mystery never likely to be solved conclusively. However, most authorities today consider the Moriori were Polynesians like the Maori, coming from Eastern Polynesia, sharing common ancestors. Tradition has it that they proceeded the Maori in their arrival in New Zealand, then about 1000 years ago, they were driven to the Chatham Islands by the more prolific Maori. 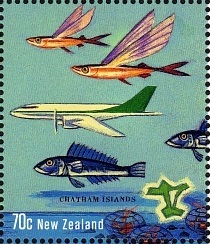 Other traditions suggest that later arrivals came directly to the Chatham Island. What is very clear is that for nearly 500 years they lost contact with any other people allowing them to develop their own particular cultural heritage. 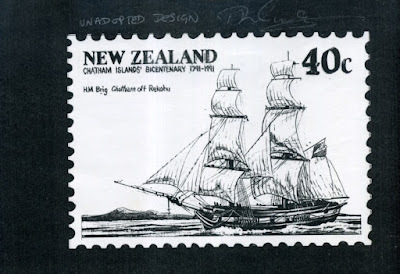 The Chathams were not discovered by Europeans until 1791 and not completely charted until 1809. European disease decimated the 2000-strong population and in 1835 invading Maori wiped out or enslaved many more Moriori. By the late 1860s their population had dwindled to fewer than 100 and by 1912 to a dozen. The last full-blooded Moriori died in 1933, though most of the Chatham Islanders have some Moriori ancestry. Moriori blood was spilt on the day of Broughton's arrival. Before then, the Moriori seem to have lived without warfare due to an agreement of no warfare or killing between tribes. The incident forebode worse to come for the Chatham Islands' non militant inhabitants. European sealers soon killed off most of the seal population, a major source of food and clothing, and also introduced diseases to which the Moriori had no resistance. Then in 1835 900 mainland Maori of Ngati Mutunga and Ngati Tama invaded and dispossessed the surviving Moriori with much bloodshed. At the time of William Broughton's arrival, there may have been up to 2,000 Moriori living in family settlements of 10-50 people. Today, the Chatham Islands are home to a resourceful community of 750 people who farm and fish successfully in the harsh environment and trade their produce for supplies from the New Zealand mainland. More recently there has been a determined renaissance among the decedents of the Moriori, the original people, to save what remains of their culture. Some of their distinctive cultural emblems appear on the two stamps in this issue. 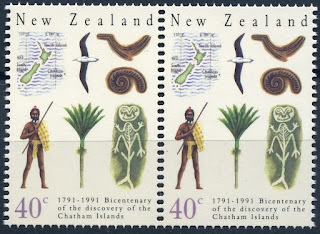 40c Chatham Island Geography and Moriori Culture. 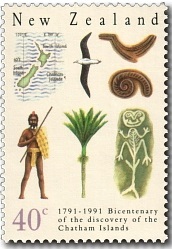 This stamp depicts a map locating the Chathams; a Royal Albatross, a source of food and wearable feathers to the Moriori; two design details from house-planks of a traditional Moriori house; a Moriori man with red parakeet feather hair ornament, albatross feather beard decoration, a staff, a woven flax loin garment and rain cape; a nikau palm, one of the more distinctive trees on the island; and a Moriori dendroglyph, or tree carving, found on neighbouring Pitt Island. 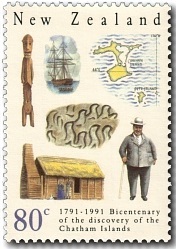 This stamp depicts a map of the two largest islands in the group, Chatham and Pitt; a carving depicting what is thought to be a traditional Moriori god; William Broughton's vessel 'The Chatham' and a rowing boat with members of Broughton's crew; a petroglyph, or rock carving, depicting seals; a typical Moriori house from the 1870s; Tommy Solomon, who popular history has it, was the last full-blooded Moriori, and who died on the Chathams in 1933. His descendants still live in the Chathams today. An unaddressed First Day Cover. A pair of 40c stamps showing double perforations. 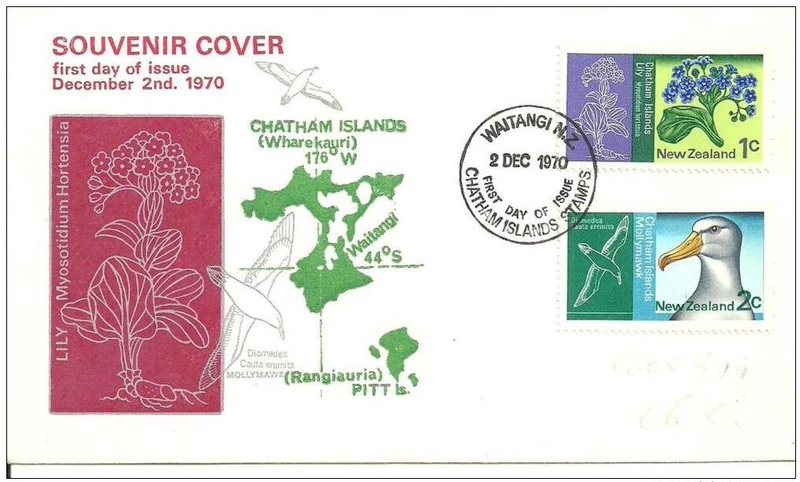 1991 Chatham Islands issue - A design commissioned by NZ Post but not issued, created by Dave Gunson, a well known New Zealand Stamp Designer. In the drawing above can be seen a view Lieutenant William Broughton's 'Chatham' with the Chatham Islands in the background. In the view below the drawing has been developed into a stamp design. 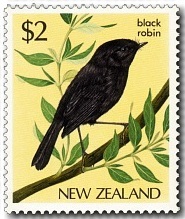 One of the world's rarest birds, the Chatham Islands black robin (Petroica traversi). Left-hand Stamp - 2009 A Tiki Tour of New Zealand. Right-hand Stamp - 2012 A Tiki Tour of New Zealand Number Two. A scene from the Chatham Islands. Map of the Chatham Islands and their location in relation to New Zealand. Waitangi has always been the most important settlement during European times. It is the only settlement that still has a post office. 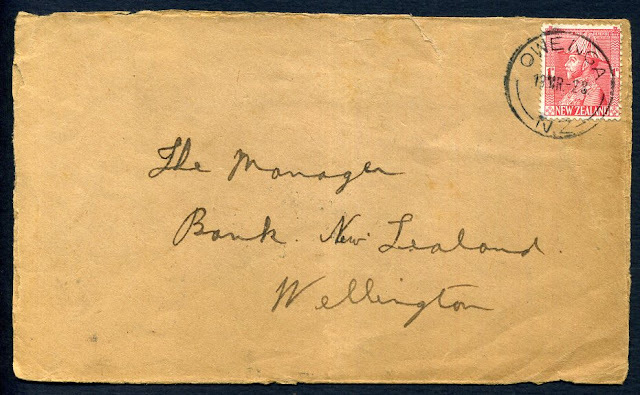 Chatham Islands Post Office, (CH), Opened 04/07/1856, Closed 18/11/1927. It was replaced with a newer post office, now in the ANZ building at Waitangi. Owenga - Opened 25/05/1927, Closed 05/09/1929. Owenga is in the South-Eastern corner of the main Chatham Island. It was once an important fishing settlement but most of that is gone now. Pit Island - Opened 08/08/1899, Closed 03/01/1927. Pit Island is the second largest island, a lot smaller than the main island, lying further to the south. For many years there was a post office there but today only a few families live there, farming the island and working with tourism. Technical information - 1970 Issue. Technical information - 1991 Issue.